Welcome to the August 2011 edition of The Leyendecker View from Leyendecker & Associates. We hope you are enjoying the summer and are able to take a break from the heat during these dog days of summer. As always, we welcome your thoughts and feedback. Well here we are again, on the edge of financial and economic challenge. The recent "compromise" in Washington was supposed to be a sort of win-win. "No, we're not going to default." The EU also recently presented their new win-win. All is finally good now, right? We shall see, but so far all the past solutions to our economic stresses have only provided a temporary respite. In the last few days, the stock market has shown that investors may fear a new recession on the horizon. Is there something different about our economy today versus the recent past? It sure seems so. The fragility of this economic recovery seems to suggest we never did fully recover from the 2008-2009 Great Recession, and maybe not even from the 2001-2002 recession. Now GDP growth is back on the edge of recession. Corporate America, however, has seen some recovery, especially those companies that are selling products to rapidly growing emerging markets, or continuing to replace labor with technology. Companies hitting on these two cylinders are accumulating mountains of cash. They are using this cash to buy out competitors, invest more in labor saving technology and invest more in the rapid growth emerging markets. All this has done little ease our unemployment. With unemployment stuck near 10%, wages are unlikely to rise anytime soon. Trying to pay down debt and consume more is difficult when wages don't move. What about the current government austerity fad? Where will that get us? If the government cuts back, it will have to lay off workers and purchase less from their private sector suppliers. In turn, those private sector companies will likely have to lay off people. Oh what a tangled web we weave! If only someone could commercialize the Star Trek teleporter, then maybe we'd find something new that everyone would need to buy, kicking off another "rising tide lifts all ships" growth period. Until then, it would seem our best bet is economic fits and spurts. How lucky we are in Houston, since nothing in the world works without energy. Is it any wonder Houston is the second fastest growing city for young people in the U.S.? Hiring always follows the economy, so an anemic economy will by definition have anemic employment growth. According to the Bureau of Labor Statistics, 28 states and D.C. registered unemployment rate increases in June, while 8 states recorded decreases and 14 states had no rate change. If austerity moves from the private to public sector, employment demand isn't going to grow. How is government austerity going to lead to private sector growth, since the government itself supports a fair amount of employees and a fair amount of the private sector? BLS data shows that Financial Activities employment peaked in 2006 and has contracted about 9% since. Over the last year, Financial Activities employment has held reasonably steady, only slightly down. But with financial regulation still attempting to take risk out of the system, it seems probable that financial activities employment may hold steady at best. With fewer opportunities for investors to risk capital where taxpayers cover the losses, investment returns will likely contract, resulting in lower overall compensation for financial activities employees. Corporate finance opportunities still appear to exist in growing independent and multinational financial service companies, as well as the private equity and hedge fund markets, both of which are evolving to become more and more global investor oriented. Generally speaking, operating companies that appear to be growing are those either with rapidly growing multinational operations or those in the natural resources sector. Domestic companies with growing international operations are likely expanding their international employment base, and perhaps even the domestic part of their employment base that supports international operations. We are of course now witnessing the upstream energy shale boom that has been attracting growing investment, which leads to growing employment. Energy midstream transportation and processing infrastructure will be needed to get that new oil & gas to market. Additionally, a recent report suggested that US. coal exports are tracking toward a 20-year high. Ultimately, however, all employment demand is dependent on general economic conditions, so any threat of actual recession in the U.S. or Europe will slow the entire global economy. As economy goes, so goes employment. Walking is one of my favorite hobbies. It may seem like a strange hobby since it is something we do anyway because we have to. But I find walking in the morning or evening, or both, refreshing and inspiring. Walking is obviously good for our physical health, but it's also good for our mental health. After a recent surgery, my doctor sent me to a nutritionist to go over my diet. Since the nutritionist was married to the doctor I was a little suspect of the intent, but what the heck. The nutritionist went over all the expected good and bad diet perspectives, but then she suggested we should all walk about 10,000 steps a day. 10,000 steps a day! "How many seconds are there in a day?" I thought. It turns out 10,000 steps is about 5 miles. Wow! That's a lot of walking, or at least seems to be, but of course we accumulate a lot of those steps during the normal course of our day. Achieving that 10,000 step goal would seem much easier for those in condensed, urban cities where walking is a common form of commute. But that's not the case in sprawling Houston. So the goal is supposed to be walking about 3 miles as a conscious form of exercise to get us to those 10,000 steps a day. I had been walking before the nutritionist gave me this prescription, but this new information did reinforce that routine. What has kept me walking, though, is not so much the physical health benefits, but the free mind time it provides. There is almost too much to keep up with in today's 24-hour news world, both on TV and online. Thirty years ago it was just the morning paper and the evening news programs. Now it's a barrage of news all day long. How does this volume and clutter of information impact our decision-making abilities? Are we better informed, or are we just overly informed? Maybe a bit of both. Regardless, there seems to be a need to clear out that overly-informed clutter so that being better informed can lead to better decision-making. To do so, we need some free mind time, and that's what walking provides me. It has led me to believe that logic doesn't really require tremendous thought, just a clear and informed mind. So walk, or do something every day that helps keep that mind of yours clear enough to make the best decisions. 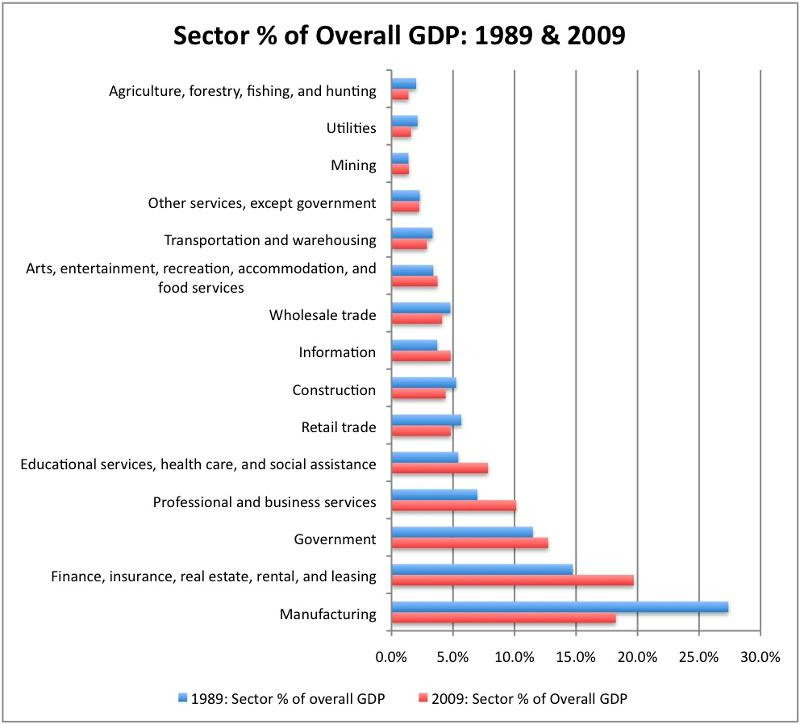 This chart looks at how the percentage contribution of each Super Sector to overall GDP has changed from 1989 to 2009. Not surprising, but still striking, is Manufacturing's dramatic 10% drop from 1989 to 2009. Also noteworthy is Financial Activities' substantial increase in overall GDP contribution, from 14.7% to 19.7% in the 20-year period. The chart also captures how much service sectors have expanded in this period, particularly against the steep drop in goods manufacturing. From 2009 through 2010, the American labor market simultaneously saw an uptick in job openings and a stagnant unemployment rate. The author attributes this to the problem of labor mismatch, where employers cannot find appropriately skilled employees for their needs, despite a larger than normal applicant pool. If we are currently seeing a mismatch issue, he argues that this should be sufficient evidence against using monetary policy to attempt to increase employment, as a mismatch issue exists entirely outside of monetary policy. Created by the Minneapolis Fed, this interactive tool allows you to compare all of America's most recent 11 recessions. You can compare the depth and length of recessions, as well as the slope of their recoveries. It also allows you to look at how each recession affected different states. Between June 2006 and June 2011, Texas has added 537,500 jobs, 10 times more than Louisiana, which came in second over the same period with 55,900 jobs. In an effort to create a more favorable business environment for entrepreneurs and small business, the Kauffman Foundation, with support from Representative Cantor (R-VA) and Senator Tester (D-MT), has introduced the "Startup Act." Small business growth remains anemic and start-up rates remain low. Among other objectives and tactics, the legislation would aim to reduce startup barriers and improve access to early stage capital through capital gains exemptions and tax incentives. Known for their controversial and compelling management philosophy (e.g. no vacation policy, take as much as you want so long as you're excelling), the company shares a slide deck revealing an overview of its progressive and unconventional leadership approach, company culture philosophy, and management style. While any team will always have some moving parts outside of your control, this article proposes 7 ways to lead a team into being greater than its individual members, including adding some drama and creating a little healthy conflict. Despite continued economic uncertainty, the Restaurants & Bars, Fabricated Metal, Computer Systems, and Telecommunications industries have seen an uptick in employment recently. Printing, and Construction continue to see little to no employment growth. Tom Malone, MIT Sloan School of Management professor, speaks about how cheap and highly accessible communication is allowing companies to break up work into tiny components and assign it to hyperspecialists all over the world. The trend is yielding more productive and effective work with greater flexibility for everyone involved. He discusses the repercussions, both good and bad, of this global trend.